Having to type all those ear defender numbers into an internet hearing protection assessment calculator has just become a thing of the past. The NEW Castle dBAir Sound Meter actually has the entire hearing protection database built into it, so you can now assess the hearing protection someone is wearing on-the-spot. If you want to do it afterwards, then the same database is available on Castle’s ‘Cloud’ software that takes data straight from the dBAir via the on-board Wi-Fi. Castle Group Ltd have launched their new safety dedicated Sound Meter, the Castle dBAir Safety, which comes with built-in access to the highly sought after “Hearing Protection Database”. Using this feature, which comes as standard in the dBAir Safety, the user will instantly be shown how much protection an operator can expect when using any particular hearing protection. For the sake of an operator’s hearing, better protection can only be a good thing. But assigning the correct hearing protection to an operator, well that’s a challenge in its own right. With 2 ways of comparing ear defenders, you are in complete control. 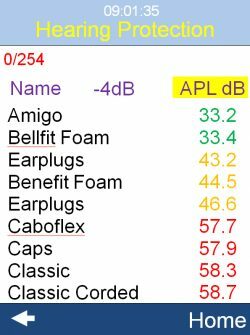 It’s possible to pick a hearing protector model and see how it performs, or you can list all the models in order of their protected levels – then you have a list of potential protectors for that task. When measurements are completed, they’re automatically sent to the web hosted Castle Cloud software, where users will be shown a selection of ideal hearing protection for each operator. The Castle Cloud provides quick, safe and comprehensive data-management direct from the instrument allowing for easy sharing of data and the security of automatic back-up. Castle are currently offering Free Demonstrations to show Safety Managers the benefits of the Hearing Protection Database, and how instant hearing protection assessments can make their jobs much easier.